Description: As the evenings get darker Kemi Burlesque wants to provide warmth, beauty, sparkle, entertainment and a good atmosphere, an evening of burlesque! During the evening we will see gorgeous, seductive, delightful, classic, fantastic and humorous performances by ‘Lapland burlesque’s’ illustrious burlesque and cabaree-performers! The evening atmosphere complements two bands that are guaranteed not to leave you cold! 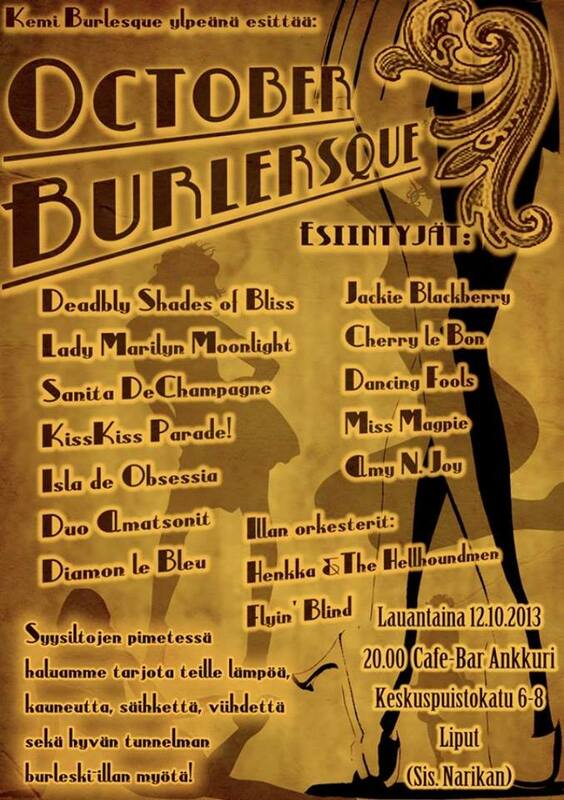 The event is in cooperation with Oulu Burlesque, Midnight Sun Burlesque, Rovaniemi and Kemin Rytmimusiikin Ystävät ry! The evening also present a little something extra! Come fall in love and enjoy a sparkling autumn evening!